What are assets and how do I manage them? In this article we'll talk about what company assets are and how to manage them with UTOPIA. The assets of the organization are an essential tool for a company's personal data management; they are all the tools in which personal data physically reside, such as lockers, servers, software, PCs or smartphones. One of the operations to be performed to respond to GDPR requests is asset mapping, or asset Inventory. The asset inventory provides a comprehensive overview of the tools of the organization, and includes both those for security and those for information and personal data management. Software: any kind of software used by and installed on network devices. 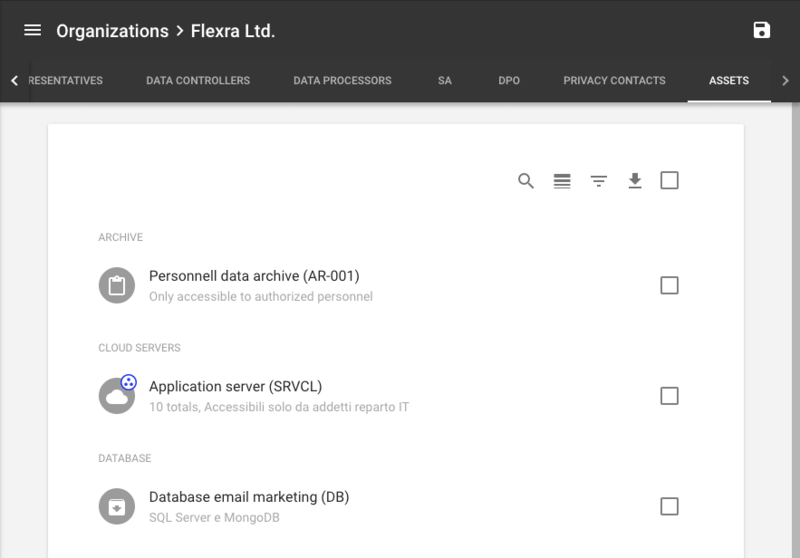 Archives: shared folders, databases, file shares and cloud services. Before starting a processing activity, it is essential to understand with which tools it will be carried out. The new European regulation requires companies to track processing activities. It is also essential to have an inventory of all the tools involved in the various processing of personal data. Before mapping the assets, it is essential to ask yourself what is the purpose of the processing operation. The design of an asset inventory must take into account the purposes, avoiding, for example, to store information that may be complex to update over time or too specific information that may even be useless. For example, an inventory of assets made to determine the level of security of information systems will have less information than that used for the purpose of warehouse management. UTOPIA allows to map and manage the assets of an organization in a simple way with the advantage of being able to link them to processing operations as required by art. 30 of the GDPR. Inventory and mapping of an organization's assets is an essential operation required to create a register of processing operations.